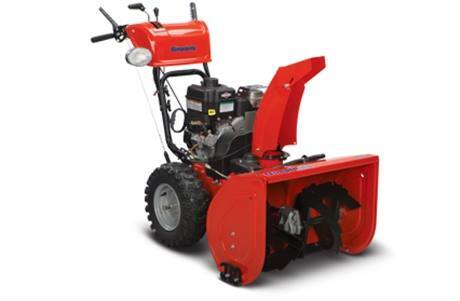 Clearing snow has never been easier than with the exclusive features found on our heavy-duty dual-stage snowblowers. 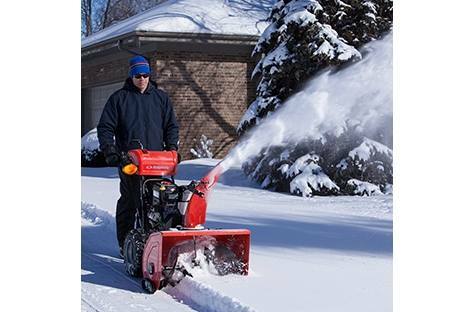 Our heavy-duty snowblower family gives you more options than ever, like an electric chute and deflector, dual trigger steering for easy turning, and heavy-duty construction to tackle the toughest snowfalls. Electric Chute & Deflector: Dash-mounted controls give the operator the ability to rotate the chute 200 degrees from left-to-right as well as adjust the deflector up and down with the simple push of a button. Free Hand™ Control: Free Hand™ Control allows you to drive with one hand while changing speed or adjusting the deflector direction with the other hand. Dual-Trigger Steering: Dual-trigger steering control makes turning easy, allowing you to stop the power to either wheel, turning the machine left or right. Heavy-Duty & Durable: Commercial-grade cast-iron auger gear case provides long-lasting durability, and the serrated steel auger cuts through the toughest snow to deliver top performance in harsh conditions.